The vision of the new building is to redefine the museum for the twenty first century, integrating learning, display and social functions. 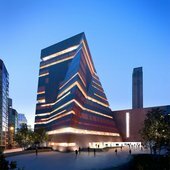 This new development to the south of the existing building will transform Tate Modern. An iconic new building will be added at the south of the existing gallery. It will create more spaces for displaying the collection, performance and installation art and learning, all allowing visitors to engage more deeply with art, as well as creating more social spaces for visitors to unwind and relax in the gallery.